Heading north to Phoenix is an easy day trip for us but we usually like to stick around for a few days and explore more. Last year we partnered with Visit Glendale and stayed a few days in March to have fun in and around Glendale. 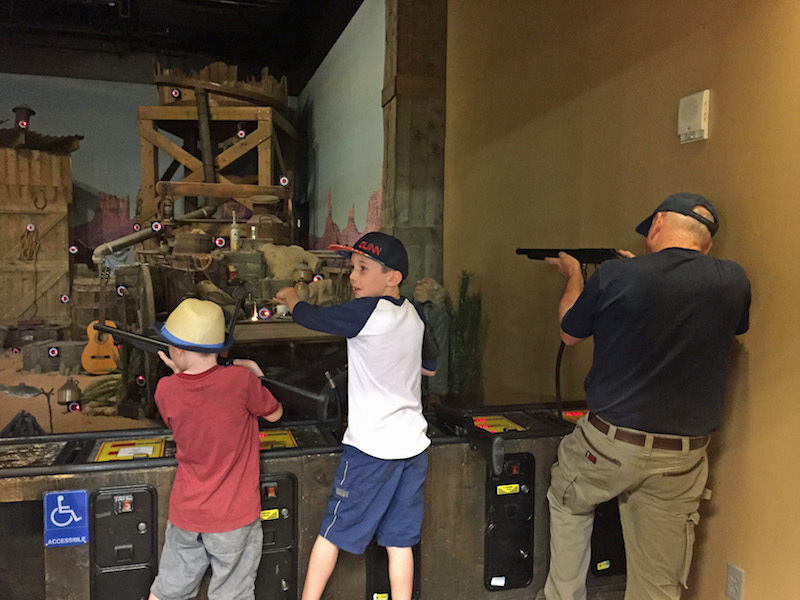 We’ve actually spent the past two spring breaks in the West Valley so we have a few opinions to share, check out our list 7 fun things to do with kids in Phoenix’s West Valley. We started our adventure at the Westgate Entertainment District which offers a variety of food and entertainment options. Our first stop was a quick snack at the Fractured Prune. The fractured prune lets customers create their own donut masterpiece by offering at least a dozen glazes and toppings. Mix and match to create your favorite donut delicacy. If you aren’t feeling creative, don’t worry, they offer lots of “recipe” ideas for inspiration. Keeping up with the creative theme, we stopped by As You Wish afterward for a little craft creation. As You Wish is a pottery painting place that offers a wide variety of projects for you and your children to decorate. There are several locations around Phoenix including one at Westgate. Video games are always a hit with my boys, so it was no surprise that they LOVED Dave & Busters, also at Westgate. I liked that you received a card to use for game credits and the same card was used to load the tickets they won, it’s much easier than carrying around a cup of tokens and pockets stuffed with tickets. After they quickly blew game credits and picked out a few prizes, we grabbed a quick lunch there too. The convenience factor won me over and the food was decent. Although keep in mind, there are tons of dining options just outside the door at Westgate. Cabela’s is a fun and frugal stop especially for visitors who don’t have a Cabela’s near them like us Tucsonans. It has trophy animals on display in re-creations of their natural habitats, plus large aquariums full of LIVE fish. 😉 Walking around and checking out the animals doesn’t cost a penny. If you do want to spend a few bucks, head upstairs to the shooting gallery. The boys enjoyed the old west themed set up. I love that it reminds me of the shooting gallery in Frontierland at Disneyland. Wildlife World Zoo is also an aquarium & safari park with Arizona’s largest collection of exotic and endangered animals. With more than 600 separate species, a petting zoo and daily shows, this 80-acre attraction is a full day excursion. There is also a huge playground and multiple rides at an additional cost. My boys had a blast and would go back in a heartbeat. I’ll be sharing more from our visit in a separate post but I definitely recommend checking out the Wildlife World Zoo. Even if your family is not into sports, I recommend checking out a Cactus League spring training game. It’s a when in Rome, sort of experience. There are 10 different stadiums in the Phoenix area including the Peoria Sports Complex and Camelback Ranch in Glendale. We enjoyed a baseball game in Peoria 2 years ago and are itching to go back. They have recently opened up Peoria Cove, an interactive kids zone featuring a 40-foot steel ship mast and sail, a small splash pad, and play structure set. I know my boys will love it! The Challenger Space Center is a fun stop for kids (and adults) interested in NASA. They offer free tours that are best suited for older children who can read the exhibits and have the patience to listen to the tour guide. I’d recommend families with little ones explore at your own pace. My boys enjoyed the interactive exhibits and the large play area at the bottom level. As you can see there are plenty of things to do with kids in Phoenix’s West Valley. Add in a few activities more central or even head to the East Valley and you can easily spend your entire spring break in Phoenix. Keep in mind that the spring is a usually high season for hotels in Arizona, especially during spring training in March. We stayed at the Thunderbird Executive Inn last year and it is very budget friendly. If you are up for a splurge check out the Wigwam Resort, we stayed there during the holidays a few years ago and it’s a lovely resort in the West Valley. Also if you are looking to save money on a trip to Phoenix, check out the POGO Pass or Groupon for deals on various attractions in Phoenix! Don’t forget to look beyond the West Valley, there are lots of Phoenix museums and kids activities in the East Valley too, especially in Scottsdale!